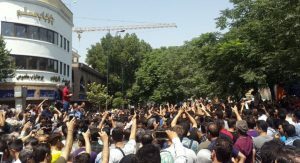 A scene of daily protests in Iran, objecting the corrupt and inhumane policies of the dictatorship ruling Iran. The Iranian regime has made international headlines over the past few weeks, after an attempted terrorist attack on the annual gathering of the Iranian opposition and supporters of the MEK, was foiled when the terrorists were arrested with 500 grams of explosives in Belgium. The mastermind of the planned attack, Assadollah Assadi, an Iranian diplomat stationed in Vienna, was arrested in Germany and charged with espionage and conspiracy to commit murder for planning the attack. 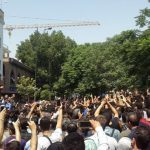 Since the terrorist attack by the regime and its minions was thwarted on June 30th, many articles have been published in international media about the Iranian regime and the reasons for the attack. The regime has repeatedly characterized the MEK as an organization with little power, but its actions prove differently. The regime, in fact, is afraid of the MEK, because it knows that it poses a viable alternative to the clerical regime, which is growing weaker each day. The Iranian regime is not only a government with the moral turpitude to carry out a terrorist act; it is also a government that would dispatch its diplomats to plan a terrorist attack against a resistance organization. This is a government desperate to hold onto power and terrified of the alternative to its rule. The regime is clearly afraid of the MEK and the threat it poses to its tenuous grip on power. The regime took great risks to attempt this attack, and in fact, the attack failed, and an Iranian regime diplomat was arrested, causing massive upheaval within the ranks of the regime leadership and a diplomatic nightmare. For the regime to attempt such a daring terrorist attack and risk embarrassment on an international level, the fear of the MEK must have been great. The MEK has always been the primary target of the mullahs’ ire, as it has been the group most likely to replace the mullahs’ tyrannical rule with democracy and freedom. The regime grows more desperate by the day as the Iranian opposition (the MEK), grows stronger. It is clear that the ruling powers are afraid of the resistance. The people are ready for change. The time has come to make that change a reality.